Burkina Faso is a landlocked, francophone Sahelian country. Gaining independence in 1960 and changing its name from the Republic of Upper Volta in 1984, the country embarked on an ambitious programme of socioeconomic improvement with an autonomist agenda. A public uprising in 2014 and military uprising in 2015 was followed by elections, a new president, the reversal of many previous Marxist policies, and the country becoming a strong ally of the USA and France in West Africa. Burkina Faso has a low GDP and rapid population growth of 3%. Agriculture is the main occupation of most of the population, but now represents only about one third of GDP. Livestock rearing is important across the country, with arable crops particularly in the south and southwest Mineral exports now make up the main export, replacing the previously dominant cotton, including gold, copper, iron and other metals. Rainfall is highly variable both annually and spatially. Most water needs are met by surface reservoirs, and irrigation by dams has been encouraged by government since 1973. Most of Burkina Faso is underlain by low productivity aquifers, and groundwater use for irrigation is minimal. Although many challenges remain in water services, the state owned water utility (ONEA) has made great improvements over recent decades, with more than 75% of the rural population and more than 97% of the urban population classed as having access to safe drinking water. A food price spike in 2008 has had long-term impacts on agricultural activities, and consequently water use, including leading government to reinstate fertiliser subsidies and control prices of some commodities. Another current source of pressure on water and other resources is the presence of refugees from Mali and some other regions in the north of the country. Please cite this page as: Koussoubé, Upton, Ó Dochartaigh and Bellwood-Howard, 2018. Much of Burkina Faso is a largely flat plain with an average altitude of 400 m above sea level, which is cut into by valleys and flood plains. Burkina Faso can be divided into three climate zones, with rainfall decreasing from south to north. There is a distinct dry season during winter months, and wet season during summer months. 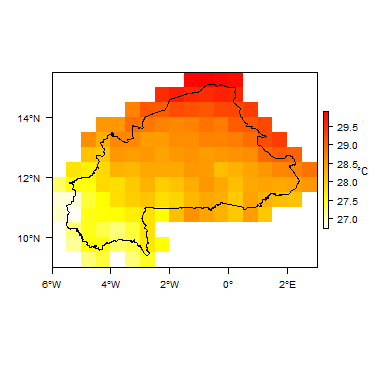 More information on average rainfall and temperature for each of the climate zones in Burkina Faso can be seen at the Burkina Faso climate page. The Volta river basin covers 63% of the country’s area, across the centre, south and west. Tributaries of the Volta system include the Nakambe, Mouhoun and Comoé rivers. The headquarters of the Volta basin authority are in Ouagadougou. The north and east are drained by rivers of the Niger basin. This section provides a summary of the geology of Burkina Faso. More detail can be found in the references listed at the bottom of this page. Many of these references can be accessed through the Africa Groundwater Literature Archive. The geology map on this page shows a simplified version of the geology at a national scale (see the Geology resources page for more details). A higher resolution map at 1:1 000 000 scale is published by the Ministere des Mines, des Carrieres et de l'Energie (Castaing et al., 2003a, 2003b). Alluvium Quaternary Detrital deposits: dominantly alluvium in river valleys; some lake deposits. Cenozoic The Continental Terminal sequence unconformably overlies Proterozoic to Palaeozoic sedimentary dolomites and other formations in the Gondo plain in the north of the country. It consists largely of fluviatile and lacustrine deposits. In the north-west, it comprises a layer of alternating clays and sands 40 m thick; and in the easy, a conglomerate-sandstone succession (Castaing et al., 2003b). Bandiagara and Koutiala sandstones, Toun Schists, Bobo Sandstone, Gobinangou Sandstone Proterozoic (Late Precambrian) to Palaeozoic These are consolidated, indurated sedimentary rocks, sometimes metamorphosed, which unconformably overlie basement rocks. They occur along the north-west and north, and in the extreme south-east of the country. They include sandstone-quartzites and conglomerates at the base, which are overlain by largely sandstone formations, interbedded with schists and rare dolomitic limestones in the west of the country. At the top of the sequence are mixed formations including argillaceous schists, quartzitic sandstones, interbedded limestones and dolomites, breccias, and marbled conglomerates. In the south-east are sandstone facies (e.g. the Gobinangau Sandstone) with pelitic schists and calcareous and phosphated strata. Birimian volcano-sedimentary and plutonic rocks; Eburnean granitoid rocks. Precambrian Basement complex of Archaean and Birimian age, consisting of belts of Birimian volcano-sedimentary and plutonic rocks intruded by large batholiths of Eburnean granitoid rocks. It includes basalt, andesite, rhyolite, rhyodacite, dacite, felsic tuffs, gabbro, diorite, granites, gneisses, shales, schists, quartzites and greenstones (Castaing et al., 2003b). Two major north-north-east-trending sinistral shear zones divide the Basement rocks into three domains: eastern, central and western, with variably north-east or north to north-north-east-trending structural features (Castaing et al., 2003b). 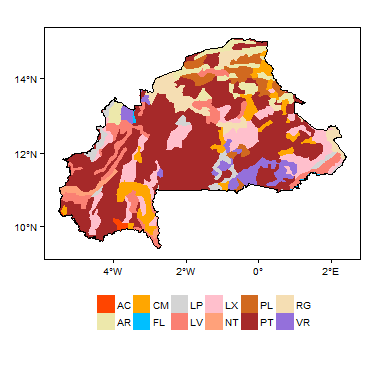 This section provides a summary of the hydrogeology of the main aquifers in Burkina Faso. More information is available in the references listed at the bottom of this page. Many of these references can be accessed through the Africa Groundwater Literature Archive. Geology is the main control on aquifer productivity and groundwater potential. Alluvium Alluvial deposits in river valleys and floodplains can have high permeability and storage capacity, where they are dominated by coarse-grained sand and gravel. Alluvium can be up to 60 m thick. Where they are underlain by permeable bedrock - e.g. sandstones or weathered basement - groundwater in the alluvial deposits is often in hydraulic continuity with groundwater in the underlying bedrock aquifer. It may also be in hydraulic continuity with river water in nearby rivers. The water table in alluvium is often shallow, less than 10 m below the ground surface (Obuobie and Barry, 2012). Alluvial deposits are not continuous and therefore form local aquifers. They can be exploited by shallow wells and by deeper boreholes. Recharge is by direct rainfall infiltration and leakage from rivers, and is strongly seasonal. Continental Terminal This aquifer has variable lithology and irregular structure. The upper layers comprise mudstones and sandstones. Sandstones form aquifer layers, which are generally in hydaulic continuity with the underlying older dolomitic limestone. Where they are overlain by unconsolidated alluvial aquifers, groundwater in the sandstone can be in hydraulic continuity with groundwater in the alluvium. The aquifer is largely unconfined. The Continental Terminal aquifer ranges in thickness from 10 m thick at its edges, up to 100 m thick in the centre of the aquifer in the plain of Gondo. The water table can range from 10 m to more than 90 m below the ground surface. Borehole depths typically range from 40 m to 120 m.
Relatively high yields of at least 10 m³/hour may be obtainable from deep boreholes into sandstone layers (Obuobie and Barry, 2012). Data from the Burkina national borehole database indicate that average yields may be over 30 m³/hour. Recharge is by direct rainfall infiltration and is strongly seasonal. Proterozoic to Palaeozoic (meta)sedimentary rocks Sandstones, dolomites and limestones form generally low productivity aquifer layers, which range from 50 to 1000 m thick. Dolomitic limestones form the best aquifers (BGS, 2002). The permeability of the upper aquifer layers has sometimes been enhanced by weathering (Obuobie and Barry, 2012). In some places they can be overlain by up to 60 m of alluvium, and groundwater is often in hydraulic continuity with the unconfined upper bedrock aquifer layers, with the water table ranging from 10 m to 60 m below the ground surface. The upper aquifer layers are typically unconfined. Lower aquifer formations can be confined if overlain by dolerite intrusions or clayey layer. In confined aquifer layers, borehole water levels are typically less than 5 m below the ground surface, and in some cases are artesian. 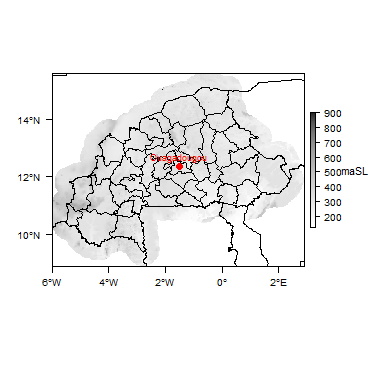 In the Bobo Diaoulasso area, fractured and weathered schists and dolomites form a 10-30 m thick weathered aquifer, in which average borehole yields of 0.5 to 5 m³/hour and transmissivity values of between approximately 15 and 50 m²/day have been recorded (Obuobie and Barry, 2012). The Gres and Intracambrian aquifers in the Bobo Dioulasso area are thought to be particularly productive aquifers. They are thought to be around 100 m thick and to have a transmissivity of approximately 120 to 415 m²/day and a specific capacity of 1 m³/hour/m (Obuobie and Barry, 2012). 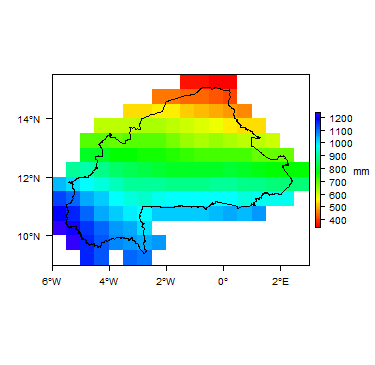 Yield data from the Burkina national borehole database indicates average borehole yields of around 4.5 m³/hour. The aquifer is used for water supply in rural and urban areas (70% of abstraction from the aquifer); and also for mineral water and other commercial/industrial use (25%) and other uses. Most recharge to the aquifer is thought to occur from seasonal rainfall infiltration by preferential flow through fractures (Obuobie and Barry, 2012). Granites, gneisses, schists, quartzites and greenstones. Basement rocks form discontinous aquifers. Groundwater storage and flow occur only where the rock is fractured and/or weathered. The upper part of the aquifer can be weathered to a depth of 10 m to 80 m. This weathered zone may be in hydraulic continuity with overlying alluvial aquifers (see Unconsolidated, above). The water table in the weathered zone can lie between 5 m and 30 m below the ground surface. Boreholes are typically from 40 m to 80 m deep. Groundwater in the weathered zone aquifer is typically unconfined. Fractured bedrock, sometimes underlying and associated with, weathered zones, also forms an aquifer in the basement rocks. Fractured aquifer zones can range from 10 m to 80 m thick, and the water table can range from 20 m to 60 m below the ground surface. Boreholes abstracting from this aquifer are between 40 and 150 m deep. Average borehole yields are around 2 m³/hour (Obuobie and Barry, 2012; yield data from the Burkina national borehole database). Groundwater from crystalline basement aquifers is dominantly used for rural water supplies (70%), with other uses being for mineral water and other commercial/industrial use (25%) and a small amount of abstraction for agriculture (2%). Groundwater is thought to be generally of Ca-Mg-HCO3 type (BGS 2002). Arsenic has been identified as a problem in some areas, particularly associated with zones of gold mineralisation in Birimian (Lower Proterozoic) volcano-sedimentary rocks (Smedley et al., 2007). Recharge occurs from rainfall infiltration and is typically low. Indirect recharge in local depressions can be important (Obuobie and Barry, 2012). Average recharge rates are estimated at 5 mm/year in the drier north and 50 mm/year in the south, but locally, recharge can be much higher, with estimates ranging up to 250 mm/year (Obuobie and Barry, 2012). Estimates indicate that over the whole countries, groundwater abstraction is only a small proportion of recharge - less than 1% in the Volta basin, and more than 5% in the far north. However, locally, groundwater abstraction may exceed recharge. Generally, groundwater in Burkina Faso is of suitable quality for drinking water supplies, although there are local problems. Naturally occuring arsenic has been identified as a problem in some areas, particularly associated with zones of gold mineralisation in Birimian (Lower Proterozoic) volcano-sedimentary rocks (Smedley et al., 2007). Pollution from nitrate is thought to be common in shallow groundwater sources, derived from domestic waste as well as agricultural sources, often highest in areas of high housing density (BGS, 2002). 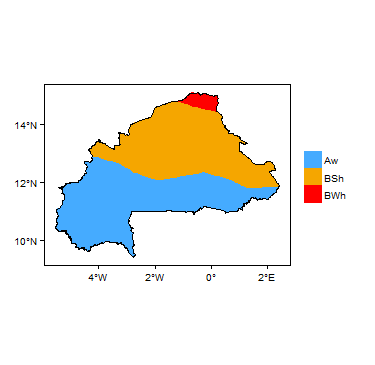 Groundwater in some areas of north-west Burkina Faso has high salinity (BGS, 2002). Groundwater in Burkina Faso is used mainly for drinking water supply, particularly for small supplies in rural areas and smaller towns. The second city of Bobo Diolasso, which lies on a moderately productive aquifer, relies relatively heavily on groundwater. The capital Ouagadougou, lying on the relatively low productivity basement aquifer, is largely dependent on surface water, but some 15% of its water supply comes from groundwater, which is particularly important in the dry season. Some groundwater is used for small-scale market garden irrigation, for example supporting dry season cultivation in the south. It is also used for for livestock watering. Industry is the smallest user of groundwater in the country (Obuobie and Barry 2012). Groundwater abstraction is mainly from drilled boreholes and hand-dug wells. The total estimated number of boreholes in Burkina Faso was 24,350 in 2005. Most boreholes are fitted with pumps: these are typically mechanised in urban areas, and hand pumps in rural areas. The Ministere de l'Environment et de L'Eau (MEE) is the government department with responsibility for sustainable use of groundwater and surface water resources in Burkina Faso. Different MEE departments are responsible for different aspects of domestic, agricultural and industrial use of water and for energy production. The National Council for Water is responsible for ensuring implementation of laws governing surface and groundwater management (Obuobie and Barry 2012). The Water Management Policy Act (2001) provided for state ownership of all water resources (with limited exceptions) and established a permit regime for water abstraction for non-domestic uses (Obuobie and Barry 2012). The national organisation with responsibility for water supply is the Office National de l’Eau et de l’Assainissement (ONEA). There is a national borehole database which currently stores information about more than 15,000 boreholes. The database includes detailed information about borehole location (coordinates and village/region); depth; whether the borehole was successful; the geology; and the borehole yield. There are no major transboundary aquifers in Burkina Faso. The following references provide more information on the geology and hydrogeology of Burkina Faso. These, and others, can be accessed through the Africa Groundwater Literature Archive. Bureau des Mines et de la Geologie du Burkina. Castaing, C, Le Metour, J, et Billa, M (Coordonnateurs). 2003a. Carte géologique et minière du Burkina Faso à 1/1 000 000. Projet SYSMIN 7 ACP BK 074: Cartographie géologique au Burkina Faso; Ministere des Mines, des Carriers et de l'Energie; Direction des Etudes et de la Planification; financé par l'Union Européenne. Castaing, C, Billa, M, Milési, J P, Thieblemont, D, Le Metour, J, Egal, F, et Donzea, U M (Coordonnateurs). 2003b. Notice explicative de la carte géologique et minière du Burkina Faso à 1/1 000 000. Projet SYSMIN 7 ACP BK 074: Cartographie géologique au Burkina Faso; Ministere des Mines, des Carriers et de l'Energie; Direction des Etudes et de la Planification; financé par l'Union Européenne. Barry B, Obuobie E, Andreini M, Andah W and Pluquet M. 2005. Comprehensive assessment of water management in agriculture (comparative study of river basin development and management). Int. Water Manag. Inst. Bretzler A, Lalanne F, Nikiema J, Podgorski J, Pfenninger N, Berg M and Schirmer M. 2017. 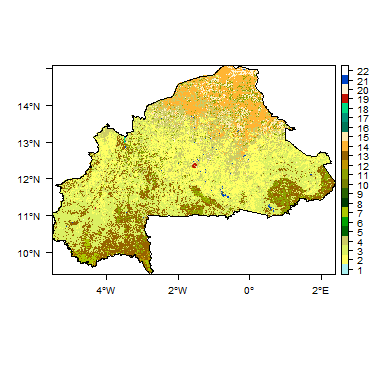 Groundwater arsenic contamination in Burkina Faso, West Africa: Predicting and verifying regions at risk. Science of The Total Environment, 584, 958-970. Ministère de l'eau. 1990. Etude des ressources en eau souterraine du Yatenga - CIEH, série hydrogéologie, 138p. Ministère de l'environnement et de l'eau. 1998. Politique et stratégies en matière d'eau 126p. Obuobie E and Barry B. 2012. Burkina Faso, in Groundwater Availability and Use in Sub-Saharan Africa; a review of fifteen countries. Pavelic, P, et al. (Eds). International Water Management Institute, Sri Lanka. Smedley PL, Knudsen J and Maiga D. 2007. Arsenic in groundwater from mineralised Proterozoic basement rocks of Burkina Faso. Applied Geochemistry, Vol. 22, 1074-1092. United Nations. 1988. Burkina Faso, in Groundwater in North and West Africa. Natural Resources/Water Series No. 18, ST/TCD/5. Department of Technical Co-operation for Development and Economic Commission for Africa.